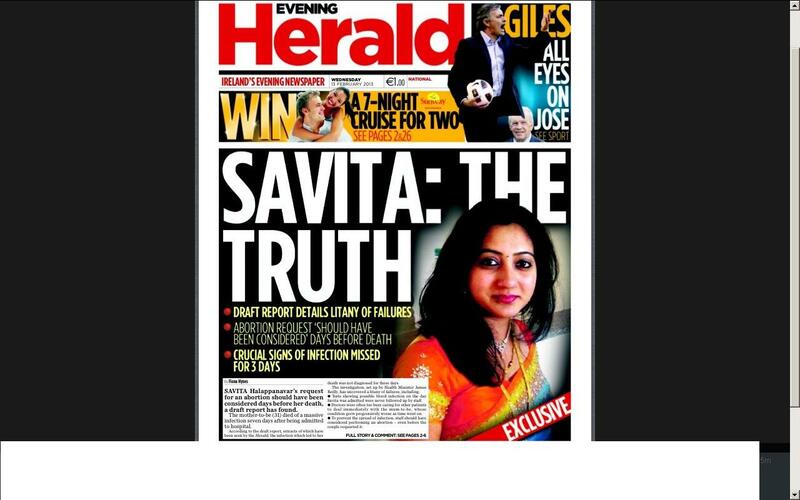 Praveen Halappanavar’s solicitor Gerard O’Donnell said today he and his client have yet to see the report of the HSE inquiry into the death of Savita Halappanavar who died at Galway University Hospital on 28 October 2012. Details from a draft report into the 31-year-old’s death were published in the Evening Herald. Mr O’Donnell said they had been contacted last week by the HSE, inviting them to participate “at a critical juncture" in the inquiry, but that they “politely declined”. Minister for Health, James Reilly, today declined to comment on the leak, saying he had not seen the report." He said he expected to receive the HSE's report in 10 days and he intended to publish it "thereafter" provided there were no legal reasons not to do so. So, how did this get into the public domain before the family had sight of it? Vinny has a good panel to look at this and the other circumstances surrounding the death of Savita Halappanavar. The government leaks like a sieve. It doesn't come from the civil servants. Could be an interesting show. Caroline is a smooth operator but with oDonnell there, it could get very very tetchy. I wonder will Vinnie try and push the pro-choice side or will he go after the medical negligence ? why do I even ask when it is obvious what will happen ? Simmons will be against 3 opposing views and the laughable impartial Referee Vinnie who is already very loud in his views on the subject. 4 against 1 , Jaysus you would think was the Frontline or some other Pravda show. Any discussion of abortion is pointless. Surely everyone has their mind made up on the subject? A whole show for a leaked draft report? Surely this is going to leave lots of hostages to fortune. Mind you, it's.not like all sides haven't their minds made up already. No Gerard O'Donnell....sorry, on the bone now!!! He is on, but through the phone.